A baby shower is enough reason to have a party, but if you want to stray away from the normal boy or girl themed showers, then consider going with a themed baby shower. Adding a theme to your baby shower helps you choose an event venue, pick out decorations, plan floral arrangements, and decide on food and desserts for your party with a new twist. Here are some popular and original theme ideas for your next baby shower! Vintage has been a popular theme over the years for obvious reasons. The vintage look is very easy to decorate, extremely aesthetically pleasing, and usually a crowd-pleaser. You can direct with black and white photos, old suitcases, and pretty much anything you can find at a thrift or vintage store! If you like cowboy hats, horses, and cute mini lassos, then a Wild West theme will be perfect for your baby shower. This theme is definitely out of the ordinary, but it will be one that will leave a mark on your guests. Whether you want lassos, cowboy hats, or stacks of hay, this baby shower will have a fun vibe to it that will be remembered forever. 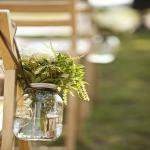 Be sure to choose a rustic venue to suit your Wild West theme! A baby blue themed baby shower is usually paired with the birth of a baby boy, but combined with Breakfast at Tiffany's decorations, you can also use this theme for a newborn girl! If you have a sweet tooth and are planning on having a cake, you can decorate the cake to look like a Tiffany's box, just like the one pictured above. Decorate the event space with silver and china, and include little details like antique napkin rings. If you're planning a baby shower sometime during the spring or summer, the weather can be worked into your theme. Planning a spring baby shower is not just easy, it is also very popular. You can use the abundance of flowers during this season and decorate the event venue with the mom-to-be's favorite flower, or go with traditional pastels that are signature spring time. Everyone knows about the story of the stork delivering a newborn baby. Why not incorporate some of these motifs into your baby shower décor? A baby bird (or duck) themed baby shower is not only adorable, the decorations are very widespread and easy to find. Not only that, but animal themes are a great preview of more kids parties to come! A mother-to-be has a lot on her plate, so a spa themed baby shower is a perfect opportunity for her to relax. While there are some things that expecting mothers should not do, for the most part, relaxing and getting pampered is a must, especially amidst all the stress of preparing for a newborn. This theme is not only relaxing, it is also enjoyable for the host and guests. While the expecting mother may not be able to drink alcohol or coffee, certain teas are still acceptable and throwing a tea party baby shower would be a great theme to consider. Whether you host it at your own home or at an event venue, you can pair various teas with scones, sandwiches, and any other bite-sized snack you enjoy! The best thing about beach themes is that they can fit almost every occasion and require little decoration. While it can sometimes be difficult to make it out to a beach, a beach theme is perfect for an outdoor venue, especially one with a pool. Some beach theme designs are perfect for a baby shower, like sea shells and sea horses. Have you thrown or been to a baby shower recently? Did it have a theme? If so, what was it? Let us know in the comments below or on Facebook or Twitter.